Nematophytes, literally "filamentous plants", are still so poorly understood that they go under the heading Enigmatic Organisms in . Therefore, any newly observed detail is potentially relevant and worth being reported. There are not many details seen in the small nematophytes usually preserved as coaly compressions . 3D-preservation in chert provides the possibility to see more. Several insights have already been obtained from the very few nematophyte specimens found in the Rhynie chert hitherto, see Rhynie Chert News 1, 13, 29, 30, 35, 36, 38, 39. More are presented in the following. The filaments of the nematophytes appear mostly as empty tubes, as in Fig.1. One may ask whether it is really tubes what is seen here or merely the tube-shaped cavities left after the organism had decayed and vanished, together with its tube, after silicification of the space between them. The aspect of the tubes suggests that there are remains of wall substance left in the chert sample. 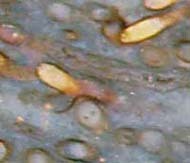 Fig.1: Nematophyte tubes in Rhynie chert, non-described species. A kinked tube (above left) allows conclusions to be drawn concerning mechanical properties of the wall material. Width of the picture 1.75mm. Independent of whether or not there is wall substance left in Fig.1, one can derive information on the mechanical properties of the tubes before silicification. One tube (above left) got a kink when it was bent by contact with others. Hence, it must have consisted of a material with some flexibility and strength. If it had been more brittle, or soft and weak, it would have broken or torn. Also the kink serves as evidence that there was a tube wall at all, which excludes the possibility of a spaghetti-like filament without wall. 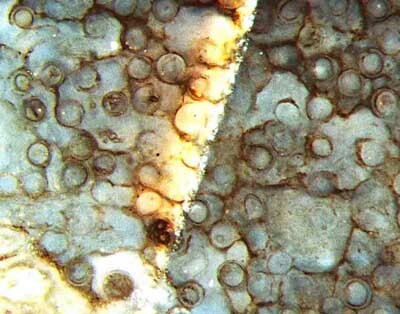 Figs.2,3: Nematophyte, non-described species in Rhynie chert; tubes well aligned, cross-sections up to 70µm, smaller ones inside indicating shrinkage. The smaller cross-sections seen inside some of the "normal" ones in Figs.2,3 pose a problem. They could possibly be degraded and shrunken tubes within the cavities in the silica gel preserving the size of the original tubes. (Such phenomenon is known from fossil plants, see Rhynie Chert News 31.) However, there are a few details, as the gap in a ring in Fig.3, which are not yet understood. A different possibility has to be considered: The smaller section may not be the shrunken tube but the cell plasma with enclosing membrane shrunk away from the tube wall. The question remains why the phenomenon is restricted to some of the tubes in some part of the specimen. A possible answer may also apply to Fig.4: For reasons unknown, silicification was not equally fast throughout the sample so that various stages of the succession of decay have become preserved. 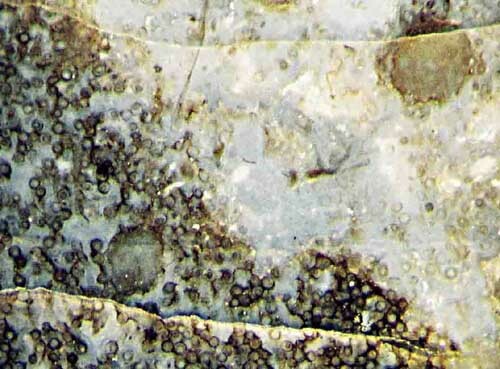 In the sample region seen in Fig.4, right, silicification seems to have been so slow that the organic gel keeping the tubes together in a lump (see Rhynie Chert News 30) decayed before it could turn into silica gel. As a result, the tubes apparently shrunk, dispersed and became bleached. 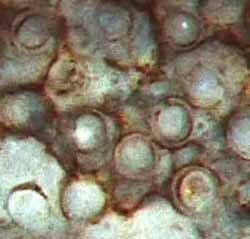 transition region between well preserved dark tubes and shrunk, dispersed, and bleached ones. The two conspicuous lumps, and perhaps a smaller third one above left, are a typical feature of nematophytes, called branch knots. They consist of a tangle of much smaller tubes and seem to be somehow related to the big ones, too. Their function, like the organism as a whole, is still enigmatic. What is seen inside a few tubes in Fig. 5 seems to be the tube content shrunken into a narrow crumpled filament. Possibly these tubes were "dead" before silicification, and the "live" tubes became silicified in such a way that they look empty now. Fig.5: Nematophyte tubes in Rhynie chert, same specimen as in Fig.1. Note the dark filament in some of the tubes. Width of the picture 0.5mm. Similar crumpled filaments inside tubes are found in Pachytheca from Lac de la Gileppe . They have not been seen in Pachytheca from Rhynie (Rhynie Chert News 1, 36). T.N. Taylor, E.L. Taylor, M. Krings: Paleobotany, Elsevier 2009. P. Gerienne: Les Pachytheca de la Gileppe ... Ann. Soc. Geol. Belgique 113(1990), 267-285.